When it comes to famous quotations, Americans seem to love them more than any other people on the planet. We put them on bumper-stickers, toss them around in political or religious debates, and use them as an excuse to avoid actually having to think too deeply about any particular topic. If it can be summed up in a phrase or two, so much the better. Baseball fans, of course, also love famous quotations, such as Satchel Paiges’s “Don’t look back, something might be gaining on you.” Simply recalling these quotes puts a satisfied smile on our face. Unfortunately, the truth is many of the quotations we take for granted as having been said by, for example, the Founding Fathers, or old-time ball players, in many instances turn out not to have been said by them at all. Sometimes, the alleged statements are inaccurate renderings of much less interesting comments. Other times, they appear to have been simply made up completely out of whole-cloth, or actually belong to someone else. Hall of Fame catcher Yogi Berra probably has more quotes attributed to him than any other baseball player in history. Yogi was lovable, successful and humble, and he looked kind of funny with big ears and the grin of a six-year old who just tasted his first ice-cream cone. What’s not to like? Many of the sayings attributed to Berra, however, are probably apocryphal. But if a quotation could be attached to the legend of Yogi Berra, it would seem to be that much more funny and interesting. The same can be said, in a way, to all the alleged quotations attributed to our Founding Fathers over the years. While these men actually did, of course, pen many significant, historical statements, many other quotations which have been credited to them (especially in recent years), are at best of suspicious origin, and, at worst, are obviously fake. I have provided a list of several famous quotations allegedly made by famous people (including Yogi Berra) which, it turns out, were probably never penned by the person to whom these lines are attributed. The quote is frequently misattributed to Washington, particularly in regards to his farewell address of 1796. The origin of the misquote is, perhaps, a mention of a similar statement in a biography of Washington first published in 1835. However, the quote that appeared in the biography has never been proven to have come from Washington. 2) “Nobody goes there anymore. It’s too crowded.” – Yogi Berra. Unfortunately, Yogi didn’t come up with this one. The origin of this quote can be traced (at least) as far back as John McNulty writing in the New Yorker magazine, in a story published February 1943, before Yogi was even in the Majors. 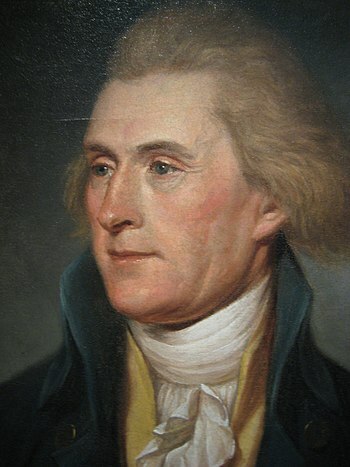 3) “A government big enough to give you everything you want is a government big enough to take away everything that you have.” – Thomas Jefferson. It appears that this statement was first made (sort of) famous not by Jefferson, but by that other Founding Father…President Gerald R. Ford. Barry Goldwater has also sometimes been credited with making this statement. As an aside, I just saw this exact quotation on a bumper sticker in a parking lot today, and it was attributed to Thomas Jefferson. The interesting thing is I also saw this same quotation on another car in a different parking lot a few weeks ago, but it was attributed to conservative philosopher Edmund Burke. So, at least in Greenville County, SC, you appear to have your choice of whom to award this statement. It’s Deja Vu again / Out of the blue again / Truer than true again / Thanks to you. “First they came for the communists, and I did not speak out, because I was not a Communist. Then they came for the socialists, and I did not speak out, because I was not a Socialist. Then they came for the trade unionists, and I did not speak out for the trade unionists, because I was not a trade unionist. Then they came out for the Jews, and I did not speak out because I was not a Jew. This quotation has always held strong emotional appeal precisely because it points out the inherent danger of good people remaining silent in the face of great evil. But was Martin Niemoller really the first to say it, assuming he ever said it at all? On the floor of the House of Representatives in October, 1968, a slightly different version was entered into the Congressional Record by Henry Reuss, a Congressman from Wisconsin. His version led off with the Jews, then moved on to Catholics, then unions, then industrialists, and finally the Protestant church. His version left out the communists and socialists. Representative Reuss credited these words to a Jewish businessman named Howard Samuels. A paraphrase of the lines attributed to Father Niemoller was discovered going back to the mid-1950’s, however, and though the thoughts are generally similar, the phraseology isn’t as clearly defined and polished as the version most commonly attributed to him. It should be pointed out that Niemoller actually did bravely stand up to the Nazis, and did survive a period of time in a Nazi Concentration Camp. Niemoller himself did later say that his favorite version of this quotation included the communists and the socialists as two of the persecuted groups because it was much closer to being historically accurate than the ones which leave out those two groups in favor of Industrialists and Catholics. Nevertheless, no written record of Niemoller making the specific statement famously associated with him has ever been located. 6) “If you come to a fork in the road, take it.” – Yogi Berra. Berra is on record stating that he’s pretty sure he never said this one. 7) “The death of one man is a tragedy. The death of millions is a statistic.” – Josef Stalin. The person who actually first wrote those words was the German journalist / satirist Kurt Tucholsky in an essay on French humor in 1932. He was a left-wing Democrat in Germany during the Weimar Republic. Later, under Hitler, his books were burned and he was stripped of his German citizenship (though he had already fled to Sweden.) He died in 1935, before the worst of the Nazi genocidal campaigns and the Second World War commenced. 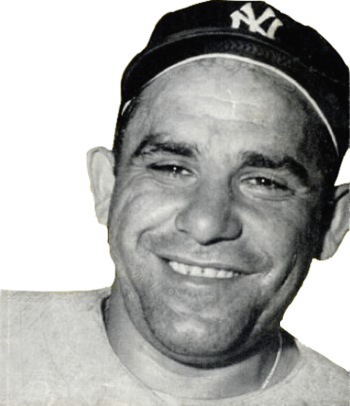 8) “Little League baseball is a very good thing because it keeps the parents off the streets.” – Yogi Berra While that very well be true, Berra didn’t say this. Instead, the quotation belongs to Rocky Bridges, who played for several Major League baseball teams from 1951 to 1961. Why does this happen so often? In many cases, there is a political motivation involved. If you can attribute a statement which appears to support your side’s political convictions to a Founding Father, for example, you gain implicit credibility in the eyes of an unsuspecting, credulous public. As for baseball fans, we just like to read cool-sounding stuff. What is the most exciting play in baseball? Is it the walk-off home run in the bottom of the ninth? How about a bases-loaded triple? For that matter, how about a triple play? Certainly, one of baseball’s most exciting plays is stealing home plate. Now, although there are different “kinds” of steals — straight steals, double steals, busted suicide squeeze plays — for the sake of brevity, this article will not differentiate between the various types. There was a time, however, when stealing home was an important tactical weapon in the arsenal of most baseball teams. Certainly, it requires the guts of a cat burglar and the stealth of a ninja. Or, at the very least, a pitcher half-asleep on the mound. Jackie Robinson often comes to mind when I think of a player stealing home. Perhaps his most famous steal of home occurred in the 1955 World Series against the Yankees in Game One. Yankee catcher Yogi Berra went ballistic when Robinson was ruled safe at home by the home plate umpire. Berra maintains to this day that Robinson really was out. This was also the only World Series the Dodgers ever won in Brooklyn, and it was Robinson’s only steal of home in a World Series. Recalling this exciting event led me to ask an obvious question, “How many times did Jackie Robinson steal home in his career? Of course, stealing home was going on in baseball long before Jackie Robinson came along. The first unrecorded steal of home must have taken place in the 19th century. We do know that Honus Wagner stole home twice on June 20, 1901. Jackie Robinson, it turns out, stole home a whopping 19 times in his career, against approximately 12 times caught stealing. Before 1950, “caught stealing” as a statistical category was not consistently recorded, so we can’t be sure exactly how many times Robinson was caught stealing home. For four of Robinson’s ten seasons, therefore, we have incomplete data from which to draw accurate conclusions regarding his overall success rate. Shane Tourtellotte of the Hardball Times, in an interesting and provocative article published on March 2nd of this year, posits the interesting hypotheses that Robinson’s 19 successful steals of home (20, if you count the one in the ’55 Series), were worth more in run-producing, game-winning value than all of his other steals combined. I was surprised that, although Robinson’s 19 steals of home are impressive, they are not nearly the greatest total of all time. Ty Cobb’s record of 54 career steals of home is a record that I can’t imagine ever being broken. The most recently active player with at least ten career steals of home plate is Paul Molitor, who retired 14-years ago at age 41. The biggest surprise to me on the list I posted above is Lou Gehrig. Who knew Gehrig stole home just four fewer times in his career than Jackie Robinson? In truth, if Gehrig had one flaw as a baseball player, it was as a base stealer. In his career, Gehrig stole 102 bases, but was also thrown out 100 times. 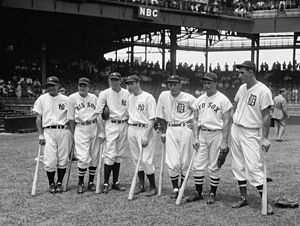 Anyway, if you have Babe Ruth and Tony Lazzeri around you in the lineup, is there really any reason to try to steal home? Speaking of Babe Ruth, it may also come as a surprise to you that The Bambino actually stole home ten times in his career, most, presumably, on the front end of double-steals. Strategies and game conditions have, of course, changed a great deal over the past hundred years. For many reasons too numerous to discuss in this post, the steal of home hasn’t been a significant part of the National Pastime for decades. Nevertheless, when it does occur, it brings us back to a time when daring base runners challenged pitchers to a duel unlike any other in sports: I can run faster than you can throw. It is a challenge that links us to baseball’s historic past, even as the game continues to evolve on into the future. Over at Baseball Past and Present, Graham Womack is conducting a fun and interesting survey of who his readers believe are the best of the best, regarding baseball’s Hall of Fame. He is calling it the Inner Circle project. If you click on the link, you’ll find access to a ballot which includes players currently in the Hall of Fame. Our challenge is to choose just 50 of them (and it has to be exactly 50) who theoretically make up the core of the Hall of Fame. I submitted my ballot a couple of days ago, and decided to share it with all of you today. I have to admit that I found it very challenging to restrict my list to just 50 players. In my initial run through of the ballot, I checked off 65 names, and it was very difficult to decide which 15 players to knock off my list. I suspect that somewhere around 30-40 players will appear on just about everyone’s ballot, but I anticipate some disagreement, perhaps a great deal, regarding the final 10 or so choices. I decided to just list my choices without explanation, but I will be interested to hear which players you would have included or rejected compared to my ballot. Only 13 catchers have ever been inducted into the Baseball Hall of Fame. Certainly, as soon as Mike Piazza becomes eligible, he will join this group. Ivan (Pudge) Rodriguez is likely to become the 15th member, assuming he doesn’t get caught in the steroid scandal. Current Twins catcher Joe Mauer, owner of three A.L. batting titles, is the best bet among the current crop to make it into Cooperstown someday. Still, that means that fewer than 20 catchers will enjoy their place in the HOF for at least the next couple of decades. On average, then, approximately one catcher per Major League decade is enshrined in The Hall. Obviously, the catching position, along with third base, is one of the two most underrepresented positions in The Hall. Yet there is a catcher with remarkable career statistics who has never even sniffed Hall membership, peaking at just 3.7 percent of the Hall of Fame vote in 1994. His name is Ted Simmons. Simmons made his Major League debut with the Cardinals in 1968, the year Bob Gibson and company defeated the Tigers in the World Series. Simmons retired 20 years later as a member of the Atlanta Braves. Simmons spent the first thirteen years of his career with the Cardinals. During that time, he was named to six All-Star teams, and he finished in the top 10 in MVP voting three times. As an example of how much he was respected as a hitter, he twice led the N.L. in Intentional Walks. But it is when one compares Simmons career stats with the other 13 HOF catchers that the magnitude of his accomplishments becomes apparent. Ted Simmons hit more career doubles (483) than any catcher in the HOF. Only the still active Pudge Rodriguez has ever hit more among players whose primary position was catcher. Simmons’ 1389 career RBI’s are surpassed only by Yogi Berra. Simmons’ 1074 runs scored ranks fifth when compared to HOF catchers. His .285 career batting average would be tied for sixth with Yogi Berra. Simmons’ career On-Base Percentage (.348) is higher than those compiled by Fisk, Carter, and Bench, just two percentage points behind (again) Yogi Berra. Ted Simmons walked more times in his career (855) than he struck out (694). Simmons career OPS+ (117) is exactly the same as Carlton Fisk. Ted Simmons amassed 3,793 total bases, good for 100th all-time for ALL Major League hitters. Perhaps most impressively, not one catcher in the Hall of Fame has more career hits than Ted Simmons (2,472.) Even Mike Piazza has fewer career hits than Ted Simmons. Defensively, Simmons was overshadowed by Johnny Bench, then later by Gary Carter. There is no question that Bench and Carter were the two best N.L. catchers of their respective eras. But Ted Simmons was a good defensive catcher as well. Although Simmons never won a Gold Glove, he did lead the league in assists twice: 1972, 1978. He ranks 19th among all catchers in total putouts in for his career. Ted Simmons’ Best Forgotten Season was 1975, when, as a 25-year old, he hit .332, slashed 193 hits, and compiled 285 total bases, all career highs. He also drove in exactly 100 runs (one of three times in his career that he would reach that mark), and he also drew 63 walks while fanning just 35 times in 581 at bats. His adjusted OPS+ was 142, sixth best in the N.L. Simmons was a solid run producer as well. His 108 Runs Created in 1975 was fifth best in the league. He finished sixth in N.L. MVP voting in ’75. But Simmons was one of those players, like Eddie Murray, who had about five different seasons that could be argued was his finest, depending on which statistics you choose to emphasize. In 1977, he recorded a career-high on-base percentage of .408 along with a career OPS of .908. That same season, he also led the N.L. in Intentional Walks with 25. His WAR score of 6.3 was also a career high. He also finished ninth in MVP voting that season. In 1978, Simmons reached career highs in doubles (40), Slugging Percentage (.512) and OPS+ (148). In 1980, his final season in St. Louis before he was traded to Milwaukee, he was awarded his one and only Silver Slugger award. Simmons’ strength — his overall consistency — may have been his greatest enemy, however. Because he never had a huge season where he, like Johnny Bench, won an MVP award or led his team to a World Championship, he tended to be overlooked and taken for granted. Simmons never led his league in Home Runs, RBI’s, Batting Average, Runs Scored, or any other hitting category other than Intentional Walks and Grounded Into Double Plays. He also never won a Gold Glove award. Clearly, though, Ted Simmons deserves to be in the Hall of Fame. In fact, I would rate him first among all the players who deserve to be enshrined in Cooperstown but who have not yet received that honor. I would also rate him ahead of at least two catchers who are already in the Hall of Fame: Ray Schalk and Rick Ferrell. Writer and statistician Bill James ranks Ted Simmons as the tenth best catcher of all time. If you are in the top ten all time at any position on the baseball diamond, let alone the most difficult position of all, how can you not be considered good enough to be in the Hall of Fame? Simmons had the bad luck to be born into the same generation that produced Johnny Bench, Carlton Fisk, and Thurman Munson. Had he been born a decade earlier, or a decade later, he would have stood out as the best catcher of his generation, and his plaque would already be in Cooperstown. In baseball, as in life, timing is everything. But the time has come for Ted Simmons’ career accomplishments to be recognized and enshrined in the Hall of Fame.